Image: Araya Diaz/Getty Images for #SeeHer, Axelle/Bauer-Griffin/FilmMagic/Getty Images, Steve Granitz/WireImage/Getty Images. Tuesday was a big day for Hollywood as the 2019 Academy Awards nods were announced bright and early in the morning by actors Kumail Nanjiani and Tracee Ellis Ross. It was an exciting moment as film lovers across the land learned which films, actors, directors, writers and behind-the-camera crews got nominated for arguably the most prestigious awards in film. And as expected, celebrity reactions to the 2019 Oscar nominations continue to roll in. Some of the big winners in terms of the number of nominations this year were The Favourite, starring Emma Stone and Rachel Weisz, and Mexican-language film Roma. Other films like Vice and Green Book made big strides in the major acting categories and Black Panther got lots of love in technical categories like best costume design and best original score as well as a landmark nomination for best picture. 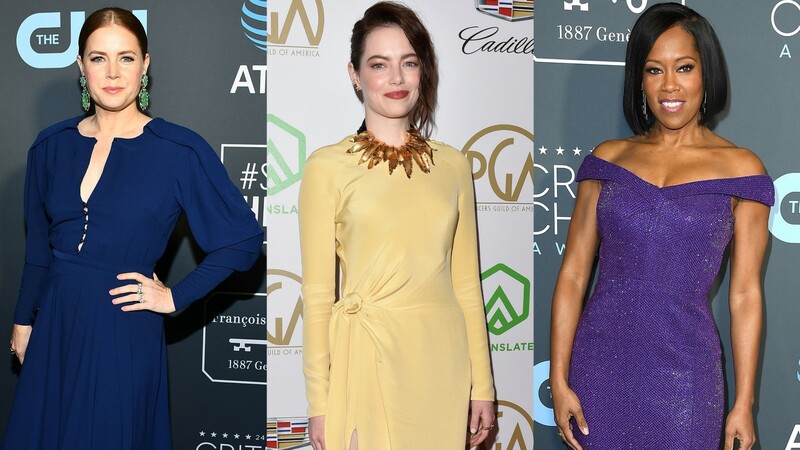 In light of all this excitement, we rounded up some of our favorite celebrity reactions to the nominations, be it folks who netted a nomination, like Amy Adams or Regina King, or those who just wanted to show love for the nominees. Check out what these celebs have to say about the 2019 Oscar nominations below. “Thank you so much to the Academy for this recognition. It is an honor to be nominated for a film that I loved making. I am grateful to [writer-director] Adam [McKay] for writing such rich material and for creating such a wonderful work environment. I also want to congratulate the other nominees, my cast members, the crew and everyone who worked so hard on this film!” Adams said in a statement in reaction to her nomination for best supporting actress for her performance as Lynne Cheney in Vice. “Wow, wow, wow. The word I keep coming back to is proud. Proud of our cast and crew with all the work we put into this amazing, yet still timely story. I’m grateful to Barry Jenkins for creating this beautiful role out of the great James Baldwin’s words. Collaborating with Barry has been a highlight of my career and this recognition is icing on the cake! And thank you to The Academy!” King said in a statement (as reported by CNN) after getting a nomination for best supporting actress for her performance in If Beale Street Could Talk. “Working on The Favourite alongside my brilliant friends Olivia Colman, Rachel Weisz and the whole cast was nothing short of incredible,” the supporting actress nominee said in a statement. “I was grateful every day and am honored by this nomination. [Director] Yorgos [Lanthimos] created a palace for us all to play in. I am forever indebted to him and the whole team that brought this insane vision to life. Thank you to Fox Searchlight for their invaluable support and thank you to the Academy for recognizing our work,” Stone said in a general statement about her nomination for The Favourite. “Seven #OscarNoms for #BlackPanther, including best picture!! This is our reaction the first time we saw footage from the film and we’re feeling this way all over again today! Thank you @TheAcademy! #WakandaForever #Oscars,” Nyong’o wrote on Twitter in reaction to Black Panther’s Oscar nominations. “I’d like to thank the Academy for recognizing my work along with the extraordinary performances of my fellow nominees. I was so fortunate to have collaborators in Viggo Mortensen and Peter Farrelly and I’d like to congratulate them on their nominations. Through Dr. Donald Shirley, I had the gift of navigating circumstances as a profound, gifted, complicated genius. A man who had experiences and a combination of qualities that I had yet to see on film. I’m tremendously grateful for the lessons I learned through both his struggles and successes. I sincerely hope Dr. Shirley’s music and his unique contribution to our culture continues to be discovered, shared and appreciated,” Ali said in a statement on his best supporting actor nomination. Tennis legend Billie Jean King congratulated documentarians Betsy West and Julie Cohen for their film RBG, which was nominated for best documentary feature and best original song. “Congratulations to @Betsywest, @FilmmakerJulie, and the rest of the talented people associated with #RBGMovie on the film’s two #OscarNoms!” King wrote on Twitter. Rob Lowe reacted to the nominations by voicing his disappointment on Twitter that Cooper didn’t nab a nomination for best director for A Star Is Born. The 2019 Academy Awards air on Sunday, Feb. 24 at 8/7c on ABC.